Google welcomed the world to the new day with a brand new secret product that is already prepared for your use. It is called “What do you love?” (www.wdyl.com) and it goes far is streamlining Google’s widely scattered and in-contiguous products into a single, user-friendly interface that eliminates having to jump between services to find additional information. The project, which it seems no one really knew was going on under the usually forthcoming Google’s surface, takes many of Google’s more valuable services and puts them on one page. You can take a search term, put it in the query field, and a host of different Google tools will bring you information about whatever it is you want to know more about. Interested in the NFL lockout? Search it and Google News and Groups bring you the latest. 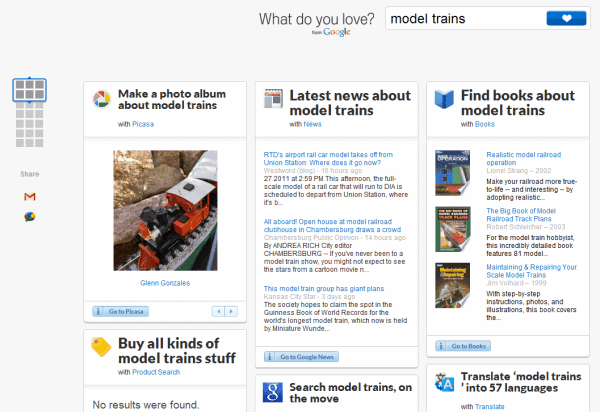 What to learn about model trains? Google Books and Picasa can bring publications and pictures that you might find useful. It is difficult to tell for sure exactly which products will be offered by What do you Love? as the product continues ramping up. After all, it has only been on the web for a few hours, and Google still has not said anything to explain the page. In a few simple searches, however, it was easy to see that Picasa, News, Books, Products, Mobile, Translate, Groups, Maps, Alerts, SketchUp, Blogger, YouTube, Trends, and even Patent Search were all involved in the mix. This is clearly no pet project of Google – it is a very clear attempt to make their services more easily accessible to users. It would seem that they have finally realized that people may not want to have to jump from Google News to Google Products when researching a new item they may want to buy – they want it all at once. It seems that at this point it is fairly important to keep searches a vague as is possible. To see for yourself, type in something simple, like baseball. You will immediately be presented with a host of information of the topic. Benjamin G. Rader’s 2008 history of the sport titled Baseball appears. Scores from last night’s games between the Cubs and Rockies pop up under news. Ways to say baseball in 57 languages are presented. All interesting information – as long as you do not allow things to get very specific. Try something a little more focused and the results are far different. A search for Merryll Lynch does not bring up much to browse through at all. There are a few blogs that bring up results, but nothing to write home about. Google Maps is utterly lost, Books cannot offer anything of significance, and even News seems to pull up more foreign headlines than anything else. Still, for most people taking a casual stroll through the internet, What do you Love? will undoubtedly be helpful in consolidating the exhaustive line of Google products. And those looking for a little more practicality when it comes to specific searches – wait a few weeks. It’s a new product, and if Google has shown us anything in the past, it’s that they tend to make things even better. My favourtie google service is at http://lmgtfy.com/ The “loves” link seems to fit in the same google bucket. When you grow tired of answering questions that are found using an easy search, try lmgtfy (Let Me Google That For You) out. It has been around forever and really isn’t advertised. As for this what do we love….someone must have been bored one day at the office – unless maybe they want to start gathering info on…hold that thought as they already get details through our searches….or maybe they are going to launch a store – hold that as surely there will be anti-trust issues…or maybe someone was just bored one day at the office.